Steel shutter is widely used concrete form work material because of its convenient to fix, remove and many time re-usability and also for its excellent concrete finishing virtue. Concrete form is made by combining different individual shutter materials. Such as wood, steel, fiber and plastic etc. Beam/Column side: This is the part of main form work of beam or column. It is made by combining 16-18 SWG sheet, MS flat bar and MS angle frame with necessary holes for fixing nut-bold/shutter clip in required shape. Beam bottom: The procedure of making beam bottom is same as beam side. 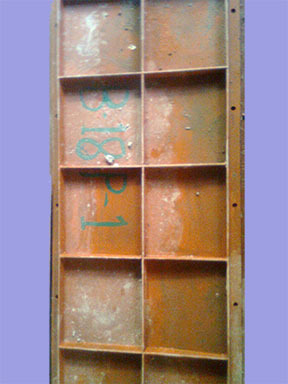 Steel Props: it is vertical supporting tool used under beam. It also can be used as column strut. Scaffolding: Scaffolding is the vertical supporting tool of slab form work. The height and width of it can vary as required. Commonly used sizes are 4′-0″ x 4′-0″ and 4′-0″ x 5′-8″. Cross bar: cross bar is used to support scaffolding horizontally. The size of cross bar depend on the size of scaffolding. is the most bottom part of slab supporting. U-head: This is also a vertical supporting tool used above scaffolding to support runner. Joint pin: Joint pin is used to joint scaffolding one above another to get the desired slab height. Turn bolt: Turn bolt is used to pull up concrete form work. Runner: Runner is a horizontal supporting tool. Normally different sizes of mild steel hollow box used as runner. Commonly used sizes are 4″ x 4″, 4″ x 3″, 3″ x 3″ and 1.5″ x 1.5″. Shutter grill: Shutter grill is used below plain sheet. It is made by welding MS flat bar. 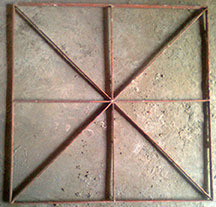 Common size of shutter grill 2.5 x 2.5 feet. Steel Beam: Temporary horizontal supporting tool used under shutter grill. Shutter clip: shutter clip is used to fix two beam/column side. for making slab form work. 16/18 SWG MS plain sheet is used for this purpose. Common size of plain sheet is 3’ x 6’ and 4’ x 8’. Keep in mind that, there are various type and shape of same material available in the market. Here I am showing only common type steel shutter material available in construction industry. Read this post “how to make slab form work using steel shutter material” from this list. Which type of shutter material do you use. Please share your idea. I completely agree with you that usage of steel shuttering materials is widely used as concrete form work in construction industry. since it is convenient to fix, remove and also can be used for many times. The best thing about this type of shuttering results in excellent finishing of the concrete. it’s a easiest way to understand the things. What type of sheet is used for shutterings. Is it cooled rolled steel or hot rolled ? This is good for us. I think we also need to know the size of angle and flat bar used in form work in deference places .